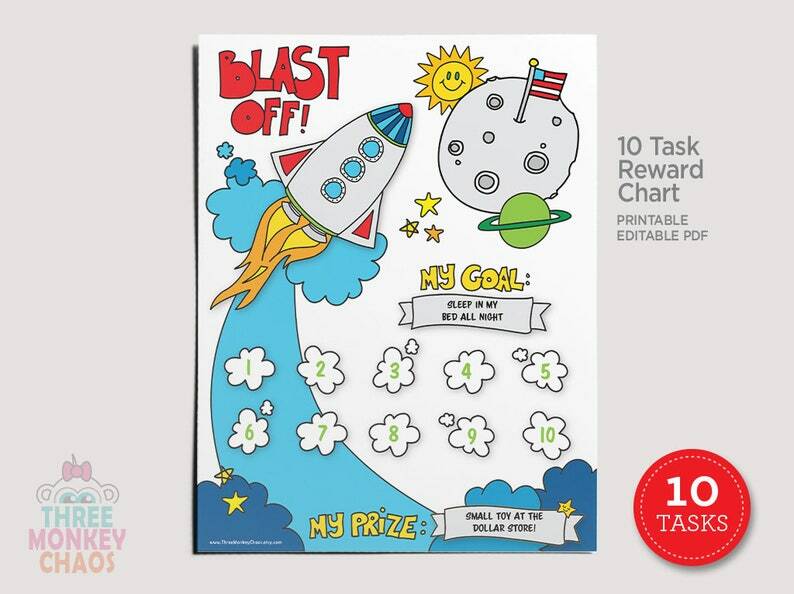 Rocket Ship Reward Chart - 10 Tasks! 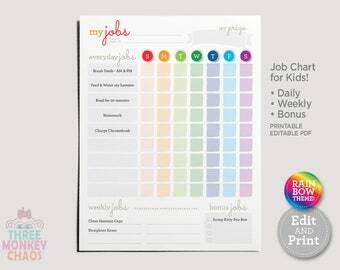 You will receive (2) 8.5" x 11" editable PDFs: (1) Reward chart in color AND (1) Reward chart in Black & White. The files are editable so you can write in your own goals using Adobe Reader or just by hand. Editable: (My Goal, My Prize). Not Editable: All other artwork and text. 3. Open / Edit the file in Acrobat Reader. 4. Print on card stock or letter paper. · Printable/Digital Instant download files are not compatible with tablets or mobile devices. · The quality of your print is determined by your printer, ink and paper used. · Artwork is NOT editable. Copyright Lisa Stanley, Three Monkey Chaos. All images, designs, and text are copyrighted and cannot be stored, reproduced, or used without obtaining prior written permission from the owner. No reselling, no mass production, no modifications, no sharing with friends. Thanks! Our son struggles a bit in the morning with his routine. This checklist is great! It was very easy to edit too. I laminated it and with dry erase markers, it is perfect! Thank you! Super Hero Valentines | Printable Valentine Cards | Classroom Valentines | DIY Cards | Editable PDF - Personalize & Print! CAN YOU EDIT THE PDF FOR ME? SURE! But convo me first before you purchase the listing. I'll create a custom listing for you for an additional customization fee. Most of my listings are Editable PDF files - meaning you can type in your own information using Adobe Reader and just print on your home computer or bring to your local copy shop! WHERE'S MY FILE AND HOW DO I EDIT IT? WHERE IS IT? Once you have completed checkout, a link will appear for you to download the file. Download and save the file to your device. You can also access the file instantly for download by clicking “You” and then selecting “Purchases". TO EDIT: You will need the latest version of Adobe Reader. If you don’t already have it, you can download the latest version of Adobe Reader - https://get.adobe.com/reader. You will need to edit your PDF on a computer. You will NOT be able to edit this file on an iPad, iPhone or any other handheld device. Once you print, make sure the printer settings are set to "Actual Size" or "100%" or "US Letter Borderless - not "Fit or Fill". Otherwise the art will end up slightly smaller than 8.5 x 11. Once you have edited your PDF you can print at home or take files to an office supply store or local print store (Staples, Office Depot, Fedex Copy Center). You will not be able to print at a photo store (Walgreens, Costco, Walmart, etc.) because the file format will not be compatible. Three Monkey Chaos is NOT responsible if you do not have suitable software or a working knowledge of how to open or use this item. Although, I am available to help to the best of my ability. 1. Print printable files for personal use. 2. Give away a print out as a gift (please no more than 3 times per printable, if you need to print more than 3 for a gift, please make another purchase!). 1. Share the file with anyone via email, USB, or any other means. 2. Sell the printable file to anyone else. 3. Sell print outs of the printable file to anyone. 4. Use the printable files or print outs in giveaways without permission. 5. Edit, manipulate, or use the printable file on products for sale. 6. Use printable files for ANY commercial use. If you don't see what you need - let me know! I am always looking for new ideas. I also design invitations, baby shower announcements, etc. Need your PDF customized? I can do that too. CONVO first and I'll set up a custom listing just for you!